*Sorry for the photo spam - just still so happy with >Stephs'< work! 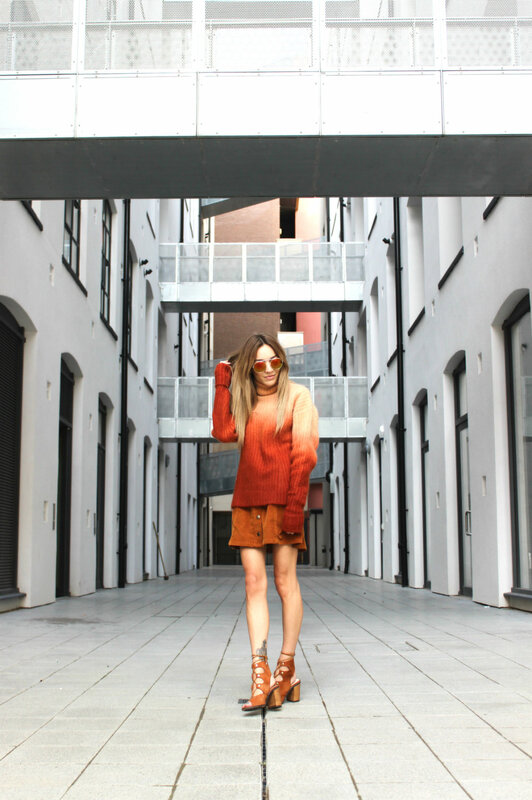 There's two things we could associate with my ombre outfit here, one being a beautiful sunset going down over the golden sands of an Hawaiian island and the second.. the burnt orange to rust gradient on Autumns' rustling leaves - the latter is more appropriate today. Summer is over and the cold season draws in leaving us only grateful for that extra hour in bed yesterday morning. But as with the changing of leaves a change in our wardrobes is upon us and that's something to get excited about! H&M launched their A/W15 Studio Collection last month with quilting, wool mixes and faux fur - you'll be happy its cold out! With a lot of the designer-worthy items selling out in an instance as always, I myself couldn't resist owning some pieces! It's always a treat when a highstreet brand brings out a premium range because the quality steps up a notch without making the price brackets unattainable, and with minus temperatures just around the corner give me ALL the wool! That jumper really is a great fall piece, and love how perfect it goes with this skirt!! !